If your grandma made you drink baking soda water for an upset stomach, it tasted terrible but it probably did the trick. This well-known home remedy can help to neutralize stomach acids and relieve indigestion, as long as the person taking it is older than 5 years of age. 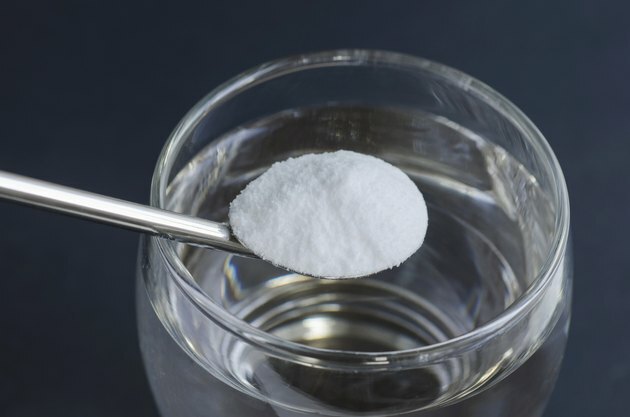 However, taking too much baking soda water can be harmful, especially in people who have diabetes, kidney disease or other chronic health conditions. According to Arm & Hammer, a manufacturer of baking soda, mixing 1/2 teaspoon of baking soda into 1/2 glass of water is a safe dose for the relief of heartburn. People between the ages of 5 and 60 can take up to 7 doses spaced at least 2 hours apart in a 24-hour period. If you are older than 60, take up to 3 doses in 24 hours. The instructions caution consumers to avoid taking the maximum dosage for more than two weeks. If you have such frequent heartburn or stomach upset, see your doctor. Because baking soda breaks down into sodium ions in the body -- an electrolyte that can have powerful effects -- taking too much baking soda can disrupt the activity of your muscles, heart and brain. According to a study published in the December 2013 issue of the "Journal of Clinical Pharmacy and Therapeutics," more than 50 percent of the 192 people reported to the California Poison Control System for baking soda between 2000 and 2012 had to go to the emergency room for treatment. Dosages ranging from a quarter of a box to more than a full box caused seizures, abdominal pain, chest pain, muscle pain and other serious conditions.